Dale and Michele had another early start. Thankfully, they were reunited with the sun, and chased it all over Blanc-Sablon and beyond. After a quick breakfast, we drove to the end of the road in Vieux-Fort to find the other ‘138 Fin’ sign, a twin to the one in Kegaska. Then we hopped our way back down the Shore towards Labrador, stopping to shoot in and around scenic St. Paul’s River, Middle Bay, and Brador Falls, along others. With warm summer sun, a light breeze, and zero flies, our last day on the Quebec Lower North Shore was made to order. As we cruised along in our borrowed car, listening to borrowed CDs, somewhere between Quebec and Labrador, we talked about the places we’d been and the people we’d met along the way. People who were intrinsically tied to their remote communities and to their way of life. Bound by generations, a shared history, and a love of the land and sea. While some people may not grasp the concept of clinging to tradition, enduring a harsher climate, or choosing a less convenient life, home is home. And in this part of the world, that’s everything. Besides being the end of our amazing journey on the South Coast, it also happened to be my wedding anniversary. And Dale’s. Just not to each other. 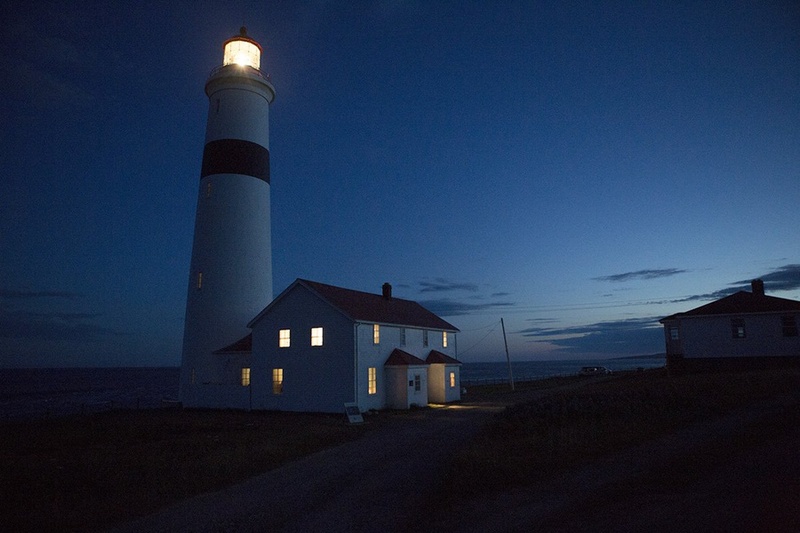 The irony of spending the evening at a romantic dinner at the iconic Point Amour Lighthouse without our spouses was not lost on us. But we embraced the chance to dine on locally-sourced cuisine in an incredible historic setting. And we were delighted with our little mason jar salads, not to mention the company. Thanks to Carmen for the wonderful dinner, Air Labrador’s Barb for allowing us to hijack your car again (Dale loves your Bob Seger’s Greatest Hits by the way), Julia for keeping our tripod safe and sound, and Michelle for absolutely everything. Tomorrow, we travel way, way North to the incredible Torngat Mountains. Part of that experience (rightly so) is to literally unplug from the world. No texting, no emails, no blogs. So we’re going off the grid. We’ll have one final post upon our return next week. Please stay tuned. Before we sign off, we want to thank everyone throughout Northern Labrador, the Labrador Straits, and the Quebec Lower North Shore who shared their homes, trucks, quads, stories, and spirit with us. We also want to thank the entire Air Labrador team for making this adventure possible. It was an unforgettable journey.